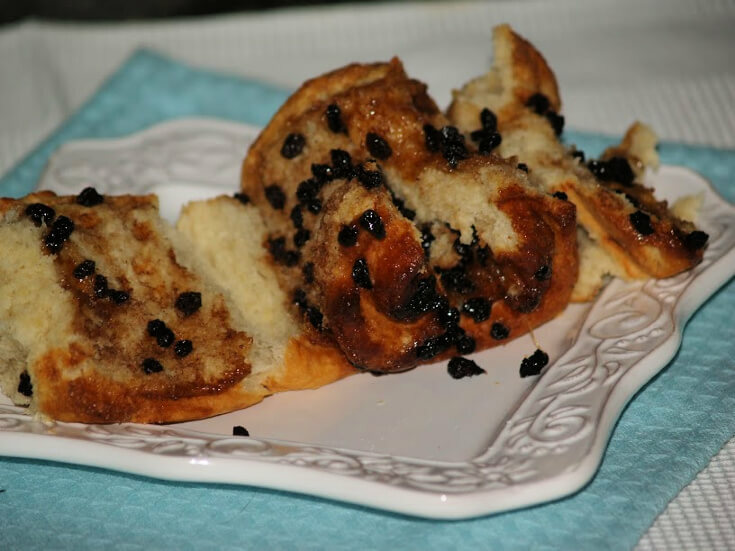 Learn how to make an Easter bun recipe which is often used interchangeably with Easter rolls. As I found described in my Webster’s dictionary, the roll is a small piece of bread and the bun is a small roll. Both the bun and roll are often made with added fruits and nuts. Both are often sweet, sometimes having icing on them. With so many similarities one can see why they are used to mean the same thing. Even though they have so many characteristics in common, When I learned how to make an Easter bun recipe, to me I found some different qualities. I always thought of the “buns” to be made with a small solid piece of dough; this “small” size could vary also. This dough might be without any sweetener or it might be made from sweet dough. As I learned how to make an Easter bun recipe, here is what I feel the difference is between the bun and the roll. To me the “roll” is a piece of dough which has been “rolled” out flat; maybe ¼ to ½ inch in thickness. Usually a filling is spread over the dough; it could be cinnamon and sugar, nuts, jams or others. Then the dough is “rolled” up like a jelly roll. From this point the roll is cut in slices; if a yeast dough, the slices are left to rise and then baked. 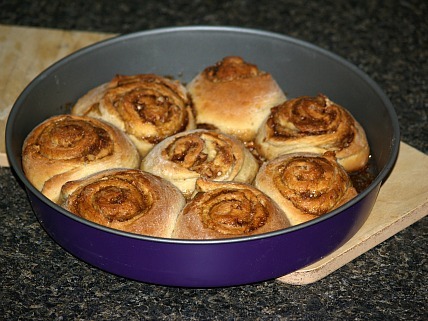 Most of the time the roll will have a “pinwheel” look and great flavor will ooze out between the layers of dough. As you can see the similarities of the Easter bun recipe and roll recipe are so great that most call them both by the same name; perhaps I am the only one who tries to separate them. “Rolls” seemed to be the most commonly used term until the popular “Cinnabuns” and “Honey Buns” were made so famous. Any firm but malleable dough can be used to shape rolls or Easter bun recipes; whatever you choose to call them. A basic bread dough can be used and will produce rolls or buns with a dense fine-textured interior. These are delicious with any Easter meal with which you choose to serve them; great with brunch or dinner. The richness of a delicious egg dough is the perfect combination for a sweet filling. This type goes well with Easter breakfast, brunch or as a snack anytime of the day. I have always loved yeast rolls and I have always loved lots of spices. This was especially true at the holidays like when I was making an Easter bun recipe or Christmas rolls. I learned years ago that I could not simply throw in extra spices without thinking. Some spices interfere in the rising power of the yeast. Allspice, nutmeg and cloves are a few which I would have added to sweet rolls especially my Easter bun recipes. I love the flavors of garlic, thyme and onion added to recipes which I wanted that Italian taste. I found that these are all ones which CANNOT be added randomly to a recipe. I am telling this to you so you don’t waste your recipe like I did; simply follow the recipe in adding spices. Since I was a young child, I wanted to learn how to make cinnamon rolls. These are the oldest and most famous of all rolls. I sometimes like to include these in my Easter bun recipes. I remember once in a while (maybe once a year) Mom would buy a few from an old fashioned bakery in our area. They were so good; we never got enough of them. The bakery smelled so good from baking cinnamon in the rolls. Any of the following the following recipes will be good to serve on your Easter brunch menu or anytime of the year. This famous Easter bun recipe was created in London by the Chelsea Bun House in the 18th century. It is known for its rich yeast dough including milk, eggs and butter. The traditional recipe also includes grated lemon rind in the dough and is filled with more butter, dark brown sugar and lots of currants. After filling the dough is rolled “jelly roll” style and sliced in thick rounds. Before baking these rolls are brushed with milk and sprinkled with more sugar. Although it sounds like a lot of sugar they are not very sweet. 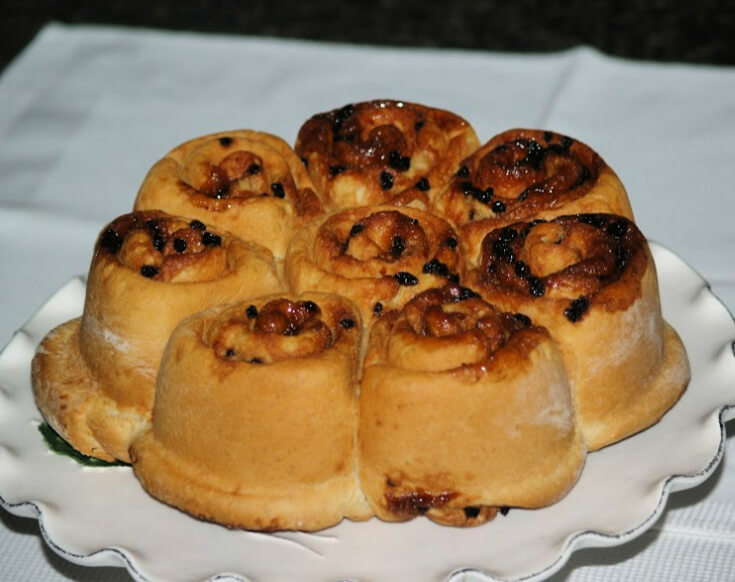 Like most old recipes, many versions have emerged from the original Chelsea Bun. Some use only white sugar or light brown sugar, some leave out the lemon and I have seen some using mixed fruit instead of the currants. Most of the recipes do include a good rich dough in common with the historical bun recipe. FOR DOUGH place 2 CUPS of the flour in mixing bowl. Add the sugar and yeast; beat in the warm milk to a smooth batter. Let mixture set aside until it becomes bubbly and frothy about 10 minutes. Beat into yeast mixture the softened butter and eggs. Gradually beat in more of the flour to a soft dough. Turn dough out onto floured surface; knead until smooth and elastic. NOTE: You want the dough to be smooth and still soft but not sticky. Place dough in greased bowl; cover with plastic wrap. Let rise until doubled in bulk about 1 hour. FOR FILLING mix currants, dark brown sugar and spice in a small bowl. Roll dough to a rectangle about 12 X 16 inches; spread filling over rectangle. Starting at the shrot end, roll up like a jelly roll; cut in 8 to 10 thick slices. Arrange slices cut side down in a buttered baking pan or bun mold pan. NOTE: If you do not have a molded pan for rolls, use large iron skillet or other pan. With the molded pan, I turn the buns upside down leaving the glaze on the bottom of buns. Let rolls set about 30 minutes to rise. Brush buns with additional milk and sprinkle with sugar. Bake for 35 minutes until golden brown; makes 8 to 10 large buns. NOTES: These are not real sweet buns. If you like sweeter they are good topped with a powdered sugar glaze. This is how to make cinnamon rolls as one of your Easter bun recipes. So delicious! Pour warm water into bowl; sprinkle yeast and 1 teaspoon sugar over water. Let mixture stand 2 to 3 minutes then stir to blend. Set in warm place for 5 minutes or until yeast bubbles. Combine 3 cups of flour, ½ cup sugar and salt in bowl; make well in center. Add yeast mixture, egg yolks and warm milk in well. Stir with large spoon combining ingredients until smooth ball forms. Place dough ball on lightly floured work surface. Knead adding up to ½ cup more of flour if needed to make dough that is not sticky. Continue to knead until dough is smooth and elastic. About 10 minutes. Place dough ball in buttered bowl and turn to coat sides. Cover bowl with towel and set in warm place to let rise until doubled in bulk about 1 hour. In small bowl combine and mix ¾ cup brown sugar, 2 tablespoons melted butter and corn syrup until smooth. Spread sugar mixture into 2 nine inch cake pans. In another bowl stir remaining ¾ cup brown sugar, raisins and cinnamon together; set aside. Punch dough down and roll on lightly floured surface to an 18 X 10 inch rectangle. Brush rectangle with 2 tablespoons melted butter and sprinkle with raisin sugar mixture. Starting at one long side roll into a tight cylinder 18 inches long. Cut with sharp knife into 14 rounds; arrange 7 cut slices in each prepared cake pan. Set pans in warm place until doubled in bulk; preheat oven to 350F degrees. 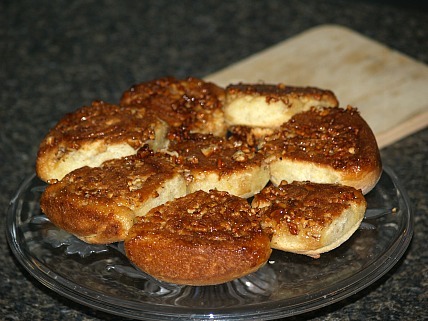 Brush tops of rolls with remaining melted butter; bake about 25 minutes or until golden brown. Invert pans on serving plates allowing all the drippings to cover the rolls. These are very popular Easter bun recipes; the white chocolate and macadamia nuts are a great combination. Heat milk in small saucepan just until bubbles form around edges. Remove from heat and add sugar, salt and ¼ cup butter stirring until butter melts; let stand until warm. Combine 1 teaspoon brown sugar and warm water in mixing bowl. Sprinkle yeast on top of liquid and stir to dissolve. Combine milk and egg; blend into yeast mixture. With electric mixer beat in 2 cups of flour until smooth; add remaining ½ cup flour stirring by hand. Mix dough until smooth and leaves sides of bowl; turn out on lightly floured surface. Knead dough until smooth; place in lightly greased bowl turning until all sides are coated. Cover with towel and let rise in warm place until doubled in bulk. Cream ¼ cup butter with ¼ cup brown sugar; spread on bottom and sides of 9 X 9 X 2 inch baking pan. Sprinkle ½ cup nuts over top of sugar mixture. Roll dough on lightly floured surface to form a 16 X 12 inch rectangle. Spread with remaining ¼ cup butter. Sprinkle with remaining ½ cup brown sugar, 1 cup nuts, white chocolate chips and cinnamon. Roll up lengthwise and cut into 12 slices; place cut side down in prepared pan. Cover with towel and let rise in warm place for 1 to 1 ½ hours or until doubled in bulk. Bake in preheated oven at 375F degrees for 25 to 30 minutes or until golden brown. Invert on serving plate; let stand 1 minute and remove from pan. This recipe is a traditional Easter bun recipe in Germany. Stir raisins with whiskey in small bowl; set aside for 2 hours. Combine flour with sugar and almonds; cut in butter. Knead until smooth; place in refrigerator for 30 minutes. Roll out to 1/8 inch thickness on lightly floured surface; cut into 2 X 3 inch rectangles. Drain raisins and place a scant teaspoonful on each rectangle at one end. Bake in preheated oven at 375F degrees for 10 to 14 minutes until lightly browned. Melt chocolate with milk; dip one end of each roll in chocolate and cool. These are always a favorite Easter bun recipe. Combine yeast and water in cup; let stand 5 minutes. Combine milk and ½ cup butter in large mixing bowl stirring until butter melts. Add yeast mixture, 1 cup flour, oats and next 3 ingredients; beat on medium speed until well blended. Gradually stir in enough flour to make a soft dough; turn out on lightly floured surface. Knead dough until smooth and elastic about5 minutes. Place dough in greased bowl turning to coat all sides. Combine and blend 2/3 cup brown sugar, ½ cup pecans, orange rind and cinnamon; set aside. Combine and blend remaining ½ cup pecans, ½ cup butter and syrup. Divide and spread mixture evenly between 2 nine inch cake pans; set aside. Punch dough down and divide in half; roll 1 portion to a 12 X 16 inch rectangle. 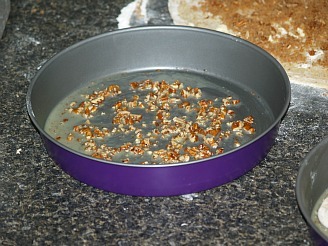 Spread 1 tablespoon butter over rectangle; sprinkle half of reserved pecan mixture over dough. Starting at short end roll dough up tightly; slice into 8 (1 ½ inch slices). Place slices cut side down in prepared cake pan; repeat process with remaining dough. Cover and let rise in warm place until doubled in bulk; bake at 350F degrees for 35 minutes. This is a great Easter bun recipe. They are delicious plus they can be prepared ahead and refrigerated. FOR DOUGH combine 2 CUPS of the flour, sugar, salt and yeast in mixing bowl. Heat milk and sour cream together to 115 to 120F degrees. Beat milk mixture into the flour yeast mixture until well blended. Stir in marmalade and as much remaining flour as possible. Turn dough out onto floured surface; knead until smooth. NOTE: Knead in more flour if needed until no longer sticky. Place dough in a greased bowl; cover with plastic wrap and towel. Let dough stand in warm place until doubled in bulk about 1 hour. In a small bowl mix together the ½ cup marmalade and toasted oceans. Punch dough down and divide into 12 equal parts. Flatten each dough part into a 3 ½ inch circle. Place 1 rounded teaspoon marmalade mixture in center of each circle. Bring edges of dough up over the filling pinching edges together to seal. Place buns (Pinch side down) on a greased cookie sheet about 2 inches apart. Cover and let rise in warm place until doubled about 30 to 45 minutes. Brush beaten egg over the buns; bake 15 to 20 minutes until golden brown. Drizzle vanilla glaze over warm buns; serve warm. COMBINE AND MIX until smooth and thin enough to drizzle.